Week 1 of my clean eating was a great success! Weekend 1, not so much. It's so tough to eat healthy when you visit with friends and family. Also, drinking is definitely a gateway to bad eating. I'm struggling to find a balance in each of them without being deprived at the same time. Problem is I love beer! This year I have given up soda (which has been tough), but I just can't give up beer! It's not that I drink it a lot, but Madison is one of the best places to find so many types of great beers. No, I'm not talking about that stuff they brew in Milwaukee and named a stadium after. Don't get me wrong - on a hot day I can't turn down a cold one of any beer, but I definitely cannot turn down a great beer from places like Capital Brewery, or New Glarus. Ale Asylum and Great Dane are a couple other local goodies not to be missed. And if you do make it to Milwaukee, skip the larger brewery and head over to Lakefront. I haven't had a beer there I haven't loved yet! This past weekend I spent a beautiful Saturday hanging out at the Memorial Union Terrace. 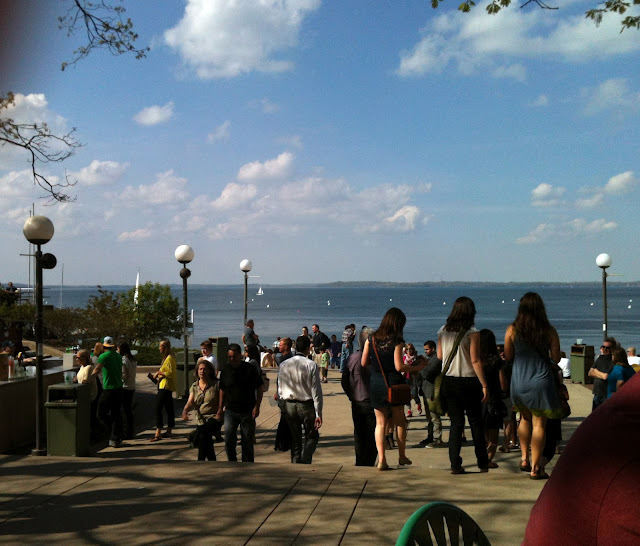 It's one of the best places where you can overlook gorgeous Lake Mendota, one of two major lakes we have right in the city of Madison. no. 1:: I work there. 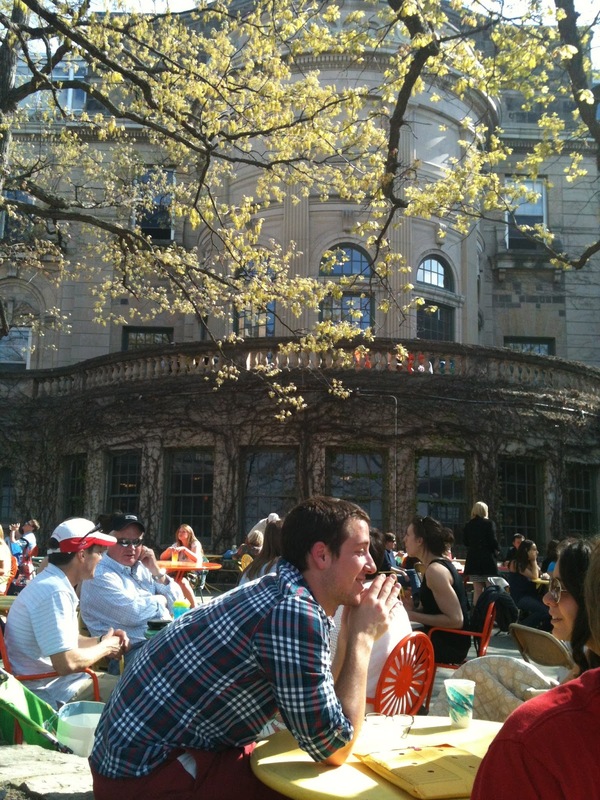 Not being a writer, I'll do my best to give you a glimmer of the coolness that is the Wisconsin Union Terrace. It is a lakefront made up of tiers where you can congregate with friends, or just grab your own table to study or read. Since the Terrace is right on the University of Madison Campus it's full of students, but you'll find every age here. Many a weekend has my family packed up the grandparents (who are a bit less mobile now-a-days) to take in the scenery, throw back a few pitchers and brats, and play some Euchre. It is quite a trip for them on their scooter and walker, but this is a place not to pass up. Even the chairs are inviting! Here are my Aunt and Cousin playing some Cribbage. Did I mention that they have this amazing German restaurant (Der Rathskeller) and beer stand (Der Stithskeller) that serves a huge variety of the local brews? My family's favorite and most consumed has to be the Capital Maibock - a seasonal beer that is halfway between a light and a dark and goes down very easy. Another great beer, that is a bit lighter and has a bit more sweetness, is the very german Franziskaner... it took me about 10 minutes to actually find how to spell this beer. A mouthful either way, it's one of Chad and my favorites but you can't drink too much of it at one sitting. The building is amazing as well - and full of so much history. Ok, enough of my beer rant! Just trust me and try them - they won't disappoint. Short story, long... my good and healthy week was off-set by a not so healthy weekend. But, such is life, right? It's all about balance! So on that note, here is the promised and healthy recipe for Italian Wedding soup. So far it has 3 bit thumbs up from Chad, his brother and Me! Happy cooking! ONE: Prepare meatballs in a large bowl, combine chicken, Italian seasoning, egg and panko. Mix well, then form into about 30 1-inch round balls; set aside. TWO: In a large pot or Dutch oven, heat oil on medium-high. Add onion, carrots, parsnip, celery, salt, black pepper, pepper flakes and herbes de Provence. Sauté, stirring occasionally, until vegetables soften, about 2 minutes. Add broth, stir to combine and bring to a boil. THREE: Stir in meatballs and pasta. Reduce heat to medium and simmer for 15 to 20 minutes. Add spinach, stir and cook for 1 to 2 minutes. Divide among serving bowls and top with Parmesan and, if desired, parsley.